I got the idea for this article while I curiously flipped through their team statistics to try to see what clicked. My first reaction when looking at batted ball data, hard hit rate, K%, BB%, etc. was “wow…they look entirely human.” It was strange how normal the advanced metrics show the Astros to be. They walk a decent amount and don’t strike out a lot, but they’re tied with the Pirates and behind the Red Sox in BB/K, so while that helps, it can’t be the only reason they’re this good. They lead the league in ISO, which tells us that their slugging percentage is pretty high, but doesn’t really explain why. In my article about Brad Peacock, I talked a little bit about the utility (and disutility) of using pitch-type linear weights to predict future pitching success (in short, the variation from year-to-year for pitchers is pretty high). Well, this is certainly more than noise. The Astros hit the absolute crap out of fastballs. For me, the only question is whether this is simply a result or if it can be used as a predictor. I think there are two important distinctions to draw between the way we’re using pitch-type linear weights here and what we did earlier. First, these are team-wide as opposed to pitcher-specific. The problem with these is that they capture a lot of context. That’s really the whole point of the stat. 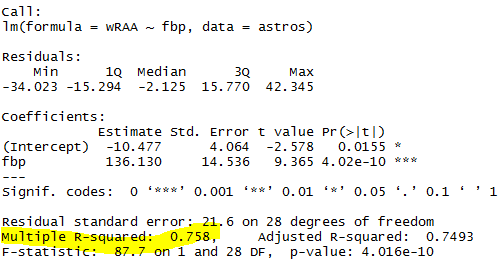 If you hit a fastball for a single and score the two runners from scoring position, your wFB is going to be much higher than if you begin the inning with one. However, because we’re looking at team-wide statistics, we should be getting measurements from enough distinct contexts that the noise begins to fade slightly. This is much different than examining Peacock’s statistics after four starts (two of which happened against the same high-strikeout team). Second, we’re looking at change in offensive run expectancy, not defensive. This could be a metric like BABIP, where pitching is highly dependent on external factors, while it is a bit more focused on skill for hitters. This raises the question “is there such a thing as a fastball hitter?” The linked article was the closest I could find to directly answering the question (I’ve looked all over the place and can’t figure out who the author is, but as far as I can tell he’s decently connected with the baseball analytics community). Either way, if we take this guy at his word, his model does suggest that some hitters do perform significantly (statistically) better against fastballs. This doesn’t completely solve all the problems with just looking at wFB (like the fact that the Astros are a naturally good-hitting team and will have many at-bats with runners in scoring position where the expected run value will be high), so we will have to devise a way to control for the context and just look at performance on a pitch-by-pitch basis. Instead of reinventing the wheel with trying to prove the existence of fastball hitters, this article seeks to prove a strong relationship between fastball-hitters and overall success. If so, this could have drastic implications for how to pitch to teams like the Astros, or even which players to target when trying to replicate the “worst-to-first” transition as the Astros have. Do “Fastball-Hitting” Teams Succeed More? This should be an obvious relationship. For starters, they’re both weighted measures of how many runs a team is expected to produce. So, if you produce more runs on fastballs relative to other teams and hold everything else constant, you by definition are going to increase your total runs relative to other teams. However, the R-squared value does raise some eyebrows. Basically, this means that about 80% of the variation in “weighted runs above average” can be explained only by looking at the wFB statistic of each team. In a sport with as much variation as baseball, that’s actually fairly decent. But, we can do better. I decided to look at the fastball linear weight for each team and divide that by the total wRAA. This should give us a decent idea of how many of those runs created came on certain pitches. 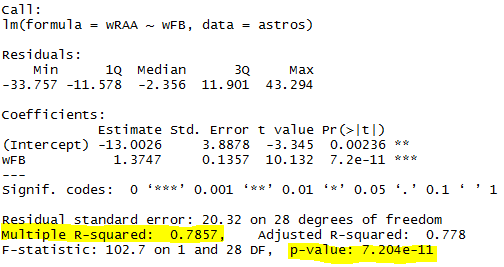 This is kind of a weird comparison, because wRAA calculates the expected runs based off of weighted on-base average (wOBA), while pitch-type linear weights scoop up all of the situational context as explained above. However, it can still give us a general idea of how many expected runs a team generates off of a certain pitch relative to league average. This surprised me quite a bit. What this says is that about 76% of the variation in wRAA (in 2017) can be explained solely by looking at the wFB/wRAA. I should also mention that even though the dataframe is called “astros” it includes the stats for every major-league team in 2017. In short, the percentage of runs you generate off of fastballs correlates pretty strongly with the total amount of runs you score. Weird stuff. There are, of course, many problems with latching on to this one observation as the basis for total change in team management. For one thing, some teams may be good at hitting fastballs just because they see them more than every other pitch. A complete 180 in the way teams pitch could bring with it a heavy response by the league’s hitters that mitigates some of the advantage, making this a self-denying prophecy. It’s worth noting, however, the Astros haven’t always been this dominant with respect to hitting fastballs. The expected run change this year is almost three times as much as last year’s value. If this is by design, why didn’t it happen last year? I’m not entirely certain, but the ridiculousness of the 95.6 value they put up in the first half this year should be a major tip. That doesn’t just happen by accident. If they have a wFB of 0 for the entire second half of the 2017 season, they would still be good for the 26th best fastball-hitting season of all time (…since 2002). That is absolutely absurd. If you’re a fan of the game, please recognize just how good the Astros are. If you’re a pitcher, you better hope they don’t make an example out of you. And for your own good: don’t throw them too many fastballs. We hoped you liked reading Stop Throwing Fastballs to the Astros by Saul Forman! Wow, this was a nice piece of research. Are the Astros seeing so many more fastballs because they constantly have men on base? Just throwing out testable hypotheses for you for follow-up research. What about the pitchers they’ve faced? Any bias in their arsenal? Have teams in the AL West in general seen a higher percentage of fastballs, or are the Astros seeing a statistically significant number of them? Just some ideas for diggin’. Well done. Thanks for the reply Jim. The answer is actually kind of surprising. The Astros are 27th/30 in FB%. (There are only 3 teams in the MLB that see fewer fastballs than them). Because above-average performance vs FB over more pitches has more effect on wFB than excellent performance over fewer pitches, its actually even more impressive how high their wFB value is given how few FB they’ve seen.